Intravesical therapy is an essential component in the treatment and prevention of non-muscle invasive bladder cancer. 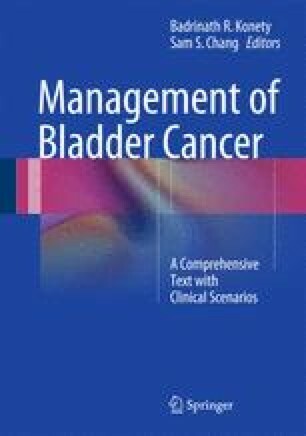 The bladder has specific properties which are amenable to local drug administration, enabling therapeutic effect while minimizing systemic exposure. The two primary forms of intravesical therapy are chemotherapy and immunotherapy. Chemotherapy can be administered perioperatively, in the adjuvant setting, and with maintenance, reducing recurrence rates. Immunotherapy primarily relies upon BCG, which reduces recurrence rates as well as progression, though with a possible increased side effect profile. Optimizing efficacy and enhancing drug delivery are current foci of active research, employing assistive technologies, new drug formulations, and host factors involved in the immune response. This chapter provides an overview of risks, benefits, and indications for existing intravesical agents. Dr. McKiernan: Celgene, Prostate Cancer Foundation.